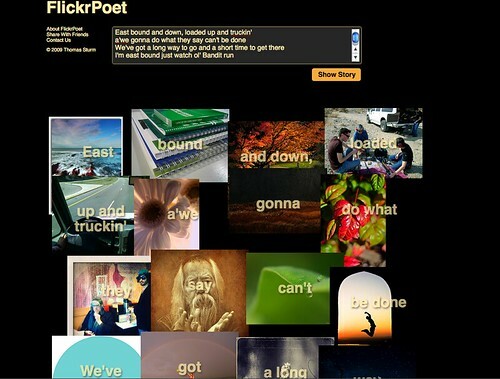 FlickrPoet, a new application from Thomas Sturm, is a search engine which will illustrate poems, prose, or song lyrics with Flickr images. Every reload of the Show Story button fetches something new – a great way to find great photos and make new contacts. Click through to one of the images and you’re on a photo page where you can fave or comment. Need more inspiration? Here’s a few more applications growing in the App Garden that can tell you a story. I'm owned by a big dog. A selection of photos from Your Best Shot 2009. Share your best! Photos from stevesteve8383, Maxfear™, Dragonovski, Damien [Phototrend.fr], andso, and beth.brousil.